Here a fun Free digital image to download for your scrapbooking and art and craft projects. 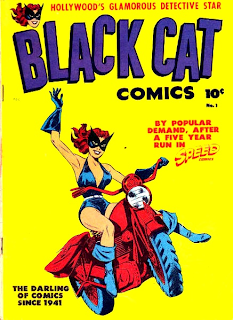 Comic book cover from Black Cat #1, Harvey Comics 1946. To download just click on the image and it will open in a new window, then you can right click and save to your computer. Sign up below and be the first to know when I upload free images, competition details and creative craft ideas. You will also recieve a gift from me of 101 free images within 24 hours of signing up, that can be used for personal and commercial purposes. You will receive emails every time I upload new content, being 2 to 5 emails per week.